Thread one end of the rope through a hole in the other end to form a loop large enough to grip three pieces of the rope. Hold the rope between your fingers to tie the button in your hand. Purpose: The Stronger Rope Shackle provides a significant increase in breaking strain over other rope shackles and is the result of a series of improvements detailed in the Sailing Anarchy Forum. Allen Edwards thought of tucking the tails inside the lines under the button to add bulk. Evans Starzinger tested the developments and suggested a new stopper knot but great tension was required to prevent it capsizing. Brion Toss settled on making the Button with a modified version of Ashley's Wall and Crown Button (ABOK # 880, p 162). The added bulk of the material under the loop reduces the kinking and increases the breaking strain to around 230% of the line strength. The Animation: This animation focuses on tying the Button Knot. Therefore, although hollow braid rope was used to form the loop, colored ropes were used to demonstrate tying the knot. The transition (frames 6-8) allowed the loop to be hidden from view. The details of threading the end through the hollow braid and the details of passing the end up the center are covered in detail in other animations. Technique: Mistakes tying this Button Knot are made easily because it is too easy to pass the ends through the wrong hole. (That was the reason for using two colors.) 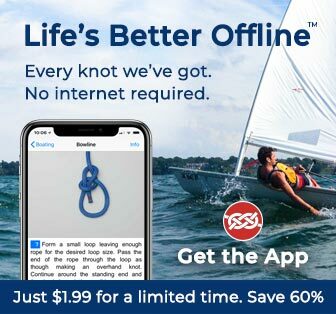 Final tightening of the Button Knot is important. Tighten each line from its origin in the center and then through the knot out to the tails. Finally, thread each tail along inside its adjacent strand, pull it out to be tapered, and then draw it back into the rope. Strength: The ideal strength might approach four times the line strength, as there are two lines on each side of the shackle – four in all. In practice, the line just under the knot and the kinking in the loop are the weak points and Evans Starzinger has previously shown that breakage typically occurs around 175% of Line Strength. The 230% found for this shackle represents more than a 30% increase in strength. However, when extra strength is required, a larger line size may often be a better option. Although Edwards describes this Shackle in detail, he generally prefers the Better Soft Shackle.